(Nanowerk News) Scientists are not usually known by their nicknames. Melanie Sanford, Professor at the University of Michigan, is an exception to that rule: Her commitment to new catalytic reactions for cleaner systems and greener processes in chemistry and her new approaches to molecule-building through breaking the normally unreactive, very strong carbon–hydrogen (CH) bond has earned the 34 year-old chemist the title “bond-breaker” in the science press. For her outstanding achievements in developing new catalytic concepts in organic synthesis Professor Dr. Sanford has won the BASF Catalysis Award 2009 worth 10,000 Euro. 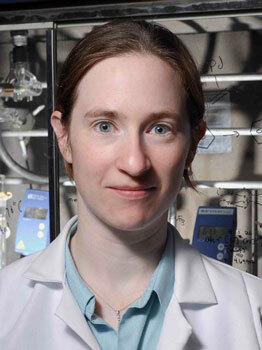 Professor Melanie Sanford from the University of Michigan receives BASF Catalysis Award 2009. “In catalysis, we are driven by the environmental challenges of our time. The starting point of my career was the question how we can use less energy in making chemicals and make the process less wasteful? Today, we want to make new molecules relevant to the pharmaceutical, fine chemical and agrochemical industries”, Sanford says. “The BASF Catalysis Award underlines the importance of catalysis for industrial synthesis. In recent years, the development of catalysts has resulted in tremendous improvements how we synthesize chemicals. Modern catalysis helps us to be more resource and energy efficient and thus makes our processes better from an economical and ecological perspective.” said Dr. John Feldmann, member of BASF’s Board of Executive Directors, at the 5th Heidelberg Forum of Molecular Catalysis. Jointly organized by the University of Heidelberg, BASF SE and the Collaborative Research Center “Molecular Catalysts”, the biennial international congress presents latest topics and results in molecular catalysis research. Award winner Sanford is familiar with industrial catalysis from her Ph.D. studies at the California Institute of Technology Caltech where she was part of the group of Robert Grubbs, 2005 Nobel laureate in chemistry for the development of the metathesis method in organic synthesis. With a background in catalysis, organic synthesis and industry, Sanford applies biological models to discover new catalytic reactions. How to make molecules react in a more controlled way and to select the right bonds in reactions are her biggest challenges in lab work. “We learn a lot from biological systems which have evolved over millions of years. In short: we do what enzymes do, but we try to develop catalysts that are more general than the natural systems”, Sanford explains. She therefore describes herself as an “organic-inorganic chemist”, with a research program spanning the areas of organic synthesis, catalysis, and organometallic chemistry. Sanford concentrates on problems at the interface of organic and inorganic chemistry and is focused particularly on evaluating reactions between organic substrates and transition metals to address current challenges in organic synthesis. After receiving her PhD in 2001, Melanie Sanford worked with Professor Jay Groves at Princeton University as a post-doctoral fellow, studying metalloporphyrin-catalyzed functionalizations of olefins. She was appointed as an assistant professor in 2003 and since 2007 teaches as Associate Professor at the University of Michigan. Recently her interest turned towards the functionalization of simple molecules such as methane or benzene, which are significant challenges for the chemical and energy sectors.